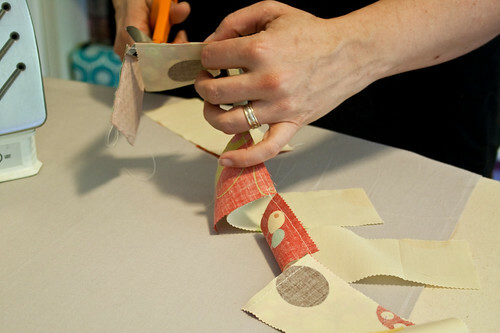 I know a few people who are wading deeper into quilting waters, so I thought I'd put together a couple tips for them. Not so much a life preserver as just a pair of water wings. Other folks like Ashley and Oh, Fransson! have put together some great starter points for the new quilter, so I'm not going to dive into that. I just wanted to share one or two of my faves for piecing. Like always, it all comes back to pressing. I've said it before and I'll say it again, the difference between homemade and handmade is pressing properly. You're going to have to love your iron. 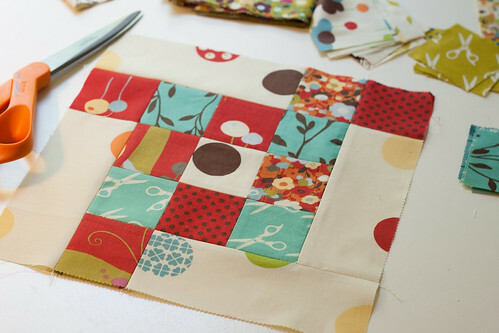 Once you've chain pieced together your squares (or whatever,) head over to the ironing board. Snip apart the chains and lay everything out flat just the way you sewed it. Here's the most important part. Press those seams flat. Don't open them up or press them to one side yet, just press them flat. 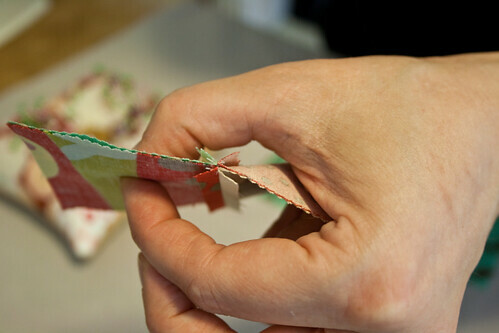 This will set the stitches, removing any wonkiness left in the thread from the sewing process. If you want a clean line afterward, do this first. Do not wiggle the iron back and forth. Just set it down, let the heat and the weight of the iron do the work. 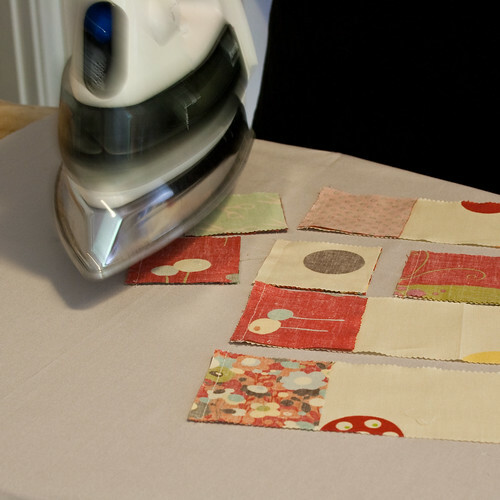 Wiggling the iron can distort the stitches and the fabric which leads to off-kilter blocks. Then once the seam is open bring the iron in and press the backside and then the frontside. Again, no wiggling! Just press. 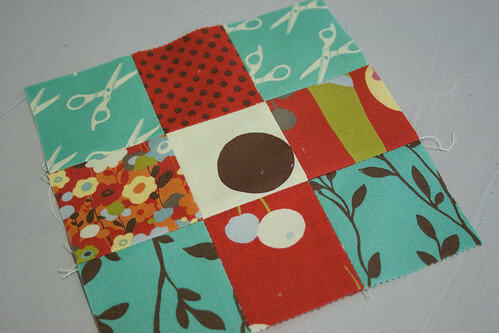 Quilting can be all about precision since you're building a block to be joined to other blocks. You want your seam allowances the same so that everything is the same size. This means you'll also want your points to line up. Take time to do it right the first time or the mistake will get exponentially bigger down the road. See how the points line up? Nice! you might finally give me the kick the pants i need to start my own quilt. The first time somebody told me about the pressing-flat thing it BLEW MY MIND. It really does make such a huge, huge difference. I'm going to say it here in the comments before someone else notices. DUDE! I sewed that edge piece on UPSIDE DOWN! Gah! I can't see your upside down piece at all. Man, you are way more thorough than I am! Which probably explains our different outcomes. Thanks for the tips. I'm getting ready to begin quilting and just ordered a bunch of books from the library. Will check out the other links you posted too. I have to admit that I'm a fly by the seat of my pants sort of sewer, but this tutorial might lead me to change my ways. Ironing seams flat first? I love that idea. I also love the use of the term water wings, and will do my damnedest to work it into conversation today. Great tips, Caro! I started machine quilting my first "big girl" quilt (not a tied quilt) yesterday. I can't wait to start my next one and press those seams flat. I had no idea. Your points are so perfectly matched! I always press my seams to the side rather than open. This is totally awesome, Caro, thanks! Thanks so much Caro! I can't wait to see more of your excellent advice. I am reading your blog on a regular basis - sorry being a lousy commenter - but now I HAVE to say your perfection level is incredible!!!! really nice work and great skills, congrats! Beautifully explained and illustrated. After years of pressing to one side, I've been experimenting with pressing seams open and I may just be converted. >I sewed that edge piece on UPSIDE DOWN! Gah! 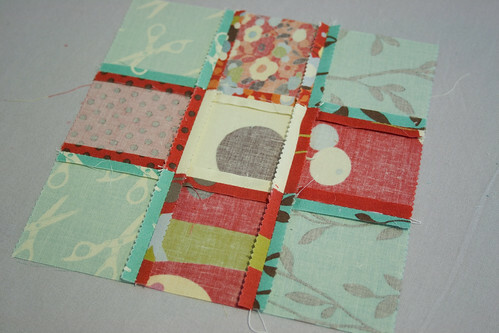 I love the fabric in this block! Lovely. Darn it, I wish I had found this earlier! Thank you for the great tips, they will definitely come in handy. Well, I think I've figured out why I far prefer knitting to quilting (and sewing in general). I hate using an iron for anything!!! Thanks for the tips. I'll try pressing my seams flat next time. well, you know what they say.... Life is in the details. And never more so than in crafting!